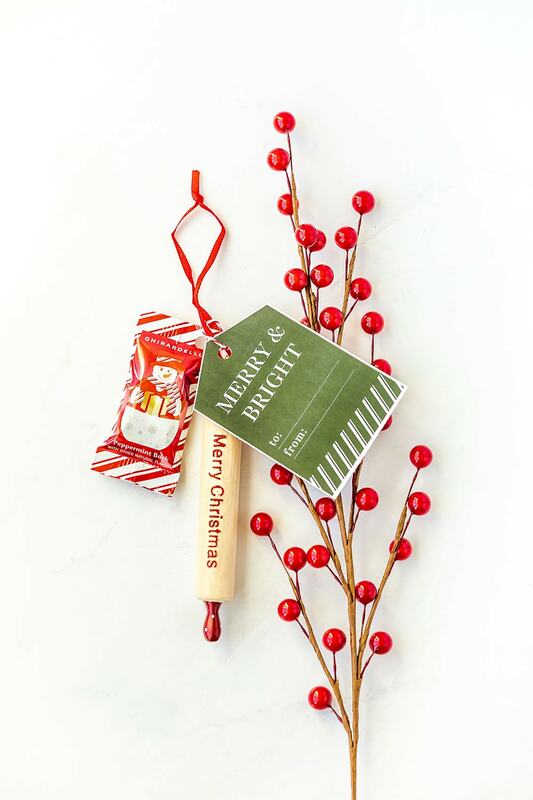 Simple and easy ideas for Christmas party favors to hand out to your guests that take just minutes to assemble. Bonus free printable gift tags and recipe card templates included below! This post is sponsored by Ghirardelli. All opinions provided are my own. 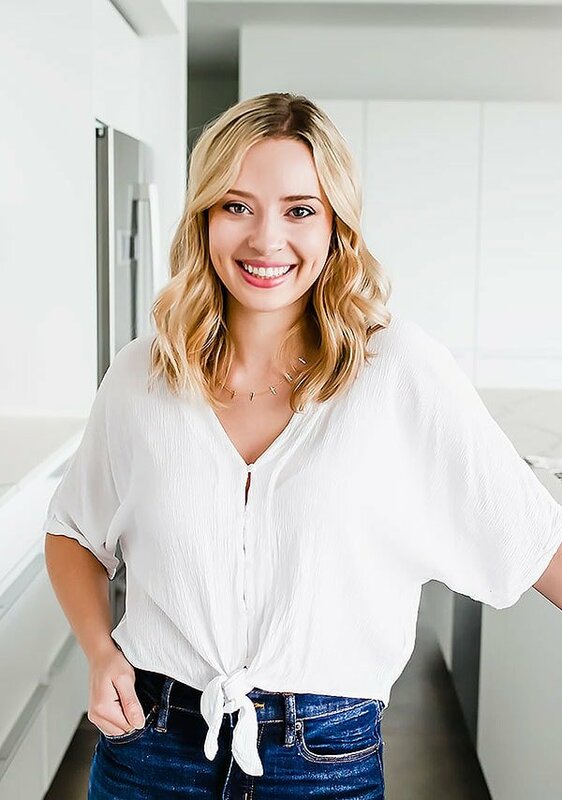 Thanks for supporting me in working with brands I love to bring you new posts! 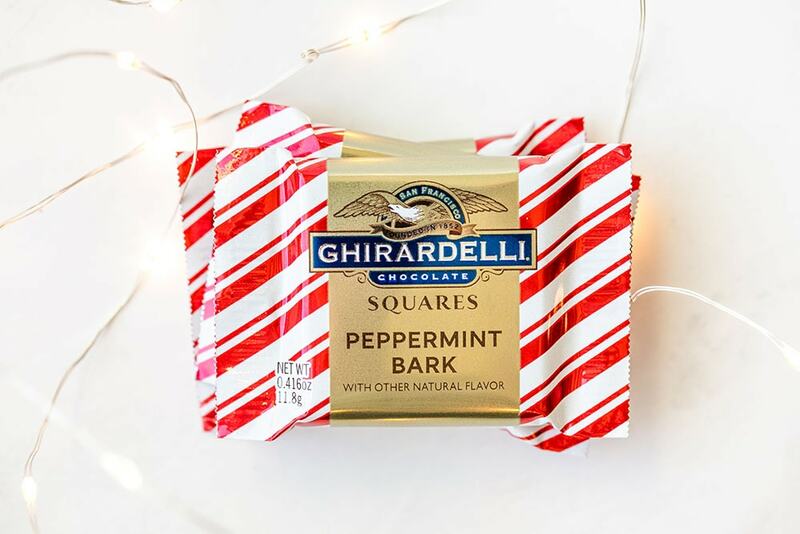 The moment I see those iconic red-and-white stripes of the Ghirardelli Peppermint Bark packaging at the store, I know it’s officially time to get excited for the holiday season. That also means that it’s time to stock up because Peppermint Bark is only offered for a limited time! And if you have these SQUARES or the adorable Peppermint Bark Snowmen laying around the house you know they won’t last very long. In fact, when we were shooting the photos for this post the aroma of peppermint and chocolate was so irresistible that it was impossible not to sample at least a few! Throughout the season I look forward to a moment of indulgence every afternoon with a Peppermint Bark SQUARE and a sip of something warm and comforting. My Peppermint Hot Cocoa recipe is perfect for this! 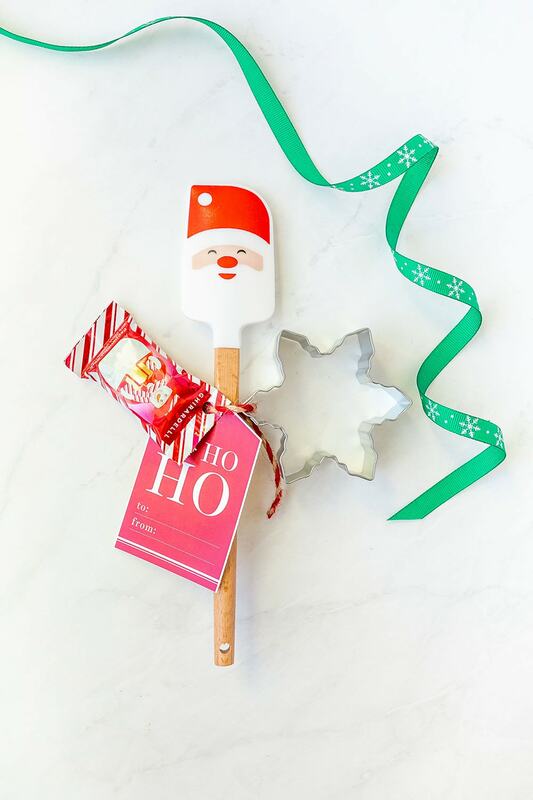 I’ve listed out more details below for how to make and assemble these little Christmas gift party favors. 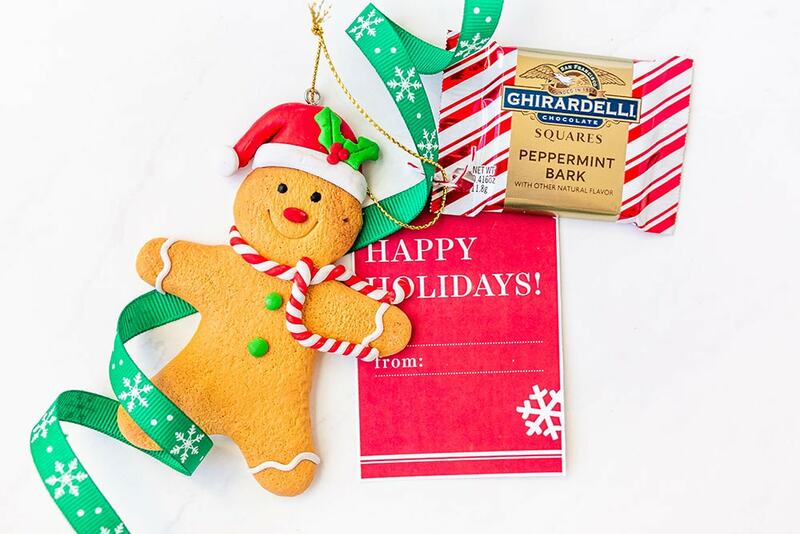 If you make any of these favor ideas, or enjoy peppermint bark this season to Make The Holidays a Bite Better, be sure to take a picture and tag myself @handletheheat and @ghirardelli on Instagram so we can see and share! These favors take just minutes to assemble, and you can find most of the pieces at stores such as Target, Hobby Lobby, and Michael’s. The best part? They don’t just make adorable party favors to give to your guests. They’re also great to hand out to your neighbors, teachers, or coworkers. 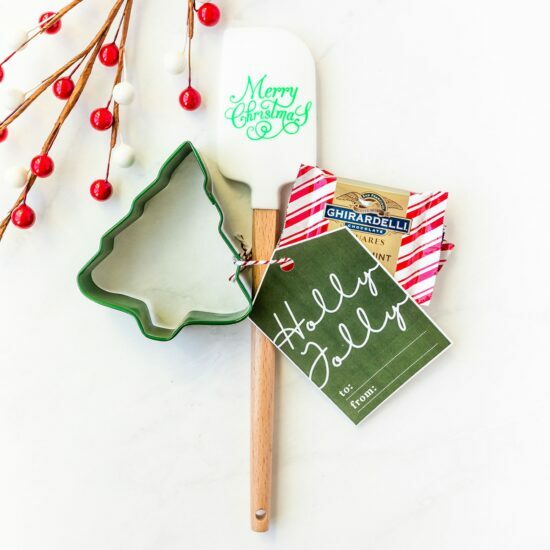 You could even personalize them with monogrammed ornaments, or ornaments you select based on the recipient’s style and interests. Have fun and get creative! Start by pairing your gift items together. I typically like to pair things of similar size, shape, or color. 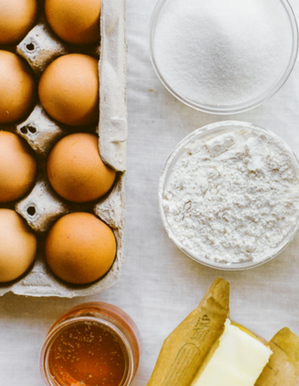 To keep things simple and delightful, pair no more than 4 total items together. If addressing the gift tags, be sure to do so first so you can write on them nicely. 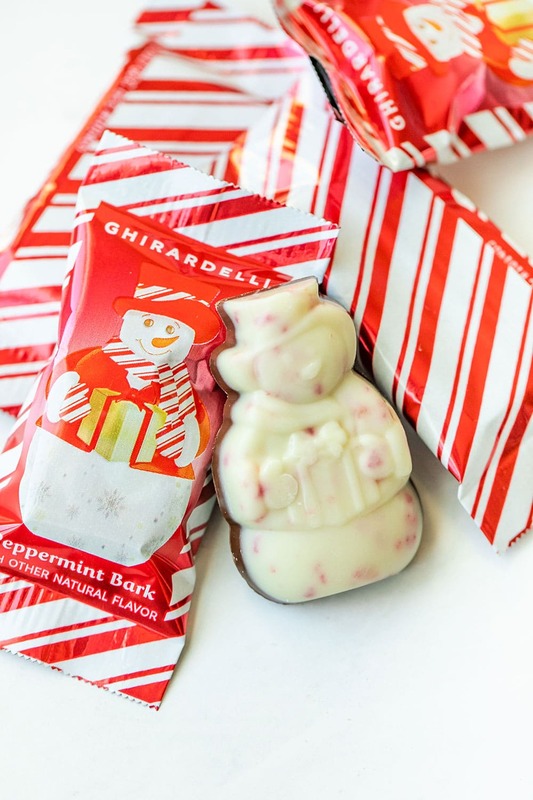 Using a hole punch, punch a hole in both the top of your gift tag and in the corner of the Ghirardelli Peppermint Bark packaging. Cut a string of decorative twine or ribbon and tie together all of the items. If you’re including a spatula, you can use the hole at the end of the spatula handle to tie the items together. However, if that would make the decorative pattern on the spatula upside-down, then you can tie everything tightly around the base of the handle. 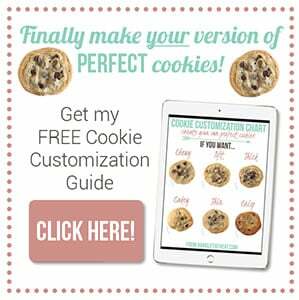 That’s it – super simple! Click here to download the free printable gift tags and recipe cards. It’s time to get excited for the holiday season!